Norwich Historical Dance was formed in 1984. We are a collection of enthusiasts brought together by a love of the music, costume and dance of past centuries. Our aims are to promote and preserve the knowledge of Early Dance, its place in our cultural heritage, and to enable the enjoyment of such dance by members of the group and the general public. As far as possible the group employ live music, often with period instruments, for their performances with musicians like 'Minstrels Gallery', also in costume. 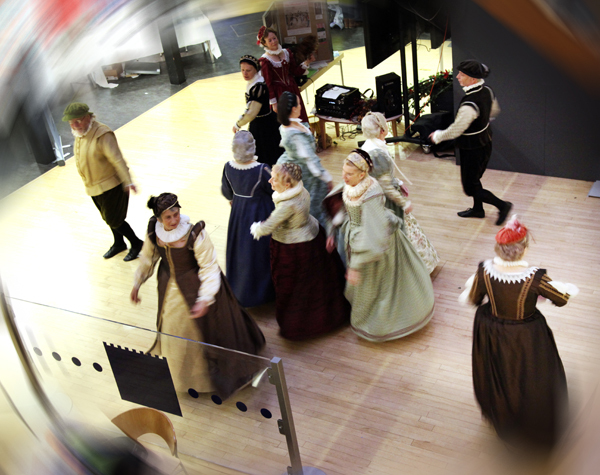 Using published research, based on original source material, the group has built up a performing repertoire of Mediaeval, Tudor, Eighteenth century and Regency dances. They range from the court dances of the Italian Renaissance, to the pavanes and galliards of Elizabethan England; they show the development of social dancing from the turbulent seventeenth century to the fashionable Assemblies of the Regency. We perform at a wide variety of events and venues, including National Trust properties, private parties, cultural celebrations and living history re-enactments. The group also gives workshops to local schools linking in with the National Curriculum. Costumes are as authentic as possible, and we usually dance to live music played on instruments appropriate to the period of the dance.